Dr Chakravarthy Full Length Movie Description : Dr Chakravarthi(ANR) completes his education in foreign and returns to india.sridevi(savitri) and chakravarthi decided to marry eachother after returning to india. chakravarthi reveals his past to savitri that his friend helped him to study in foreign and loved his sister and married her. 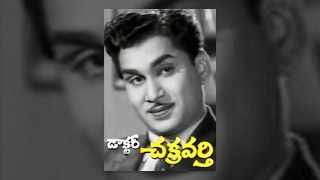 ANR loves his sister so much and he is eager to see his sister as soon as he returns to india. Later he came to know that his sister is suffering with lung cancer. she asks her last wish to marry her husband's sister. hence the story runs into tragedy. Finally ANR marries her and constructs a hospital on the name of his sister. Rest of the story you can see in the movie. Doctor Chakravarthy is 1963 Telugu drama film directed by Adurthi Subba Rao starring Akkineni Nageswara Rao and Savitri. The film is based on Chakrabhramanam novel written by Koduri Kausalya Devi.